Linn County was named for Senator Lewis F. Linn of Missouri, author of the donation land law that gave free land to settlers in the west. The churches we discuss in this chapter are or were located north of State Highway 20. 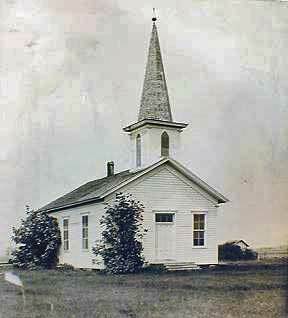 A number of churches were established in Linn County during these pioneer years and beyond. Some, like Central, have not survived. Central was so named because of its position between Albany and Lebanon. The rural community had a U.S. Post Office from 1852 to 1861. This is now the Cottonwood district west of the intersection of Highway 20 with Highway 226 to Scio and Crabtree. Established in 1851, key figures in the Central Church were John Alkire (1807-) and Sevilla Powell, Noah (1808-) and Mary Powell and Alfred (1810-1881) and Hannah Powell. There is a profile of the Powell brothers. The church met in their homes before building a church house. The original building was built on Highway 20 just west of its intersection with Knox Butte Road - probably on Paradise Road. A cemetery was there, too. After the local school building was burned by an unwilling student, school was moved to the Central Church building. Local rumor has it that the same student torched the church building, too. This was about 1874. There is no known photo of the 1st building. The church was then rebuilt one mile west, at the corner of Harber Road and Highway 20 and the cemetery was moved to the highest land in the vicinity to avoid being flooded. It is now located on Harber Road. This information was supplied by Lt. Col. George Payton Harber, US Army (Ret.). Mr. Harber personally dismantled the second building after it had fallen into disuse. 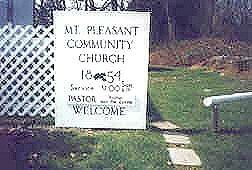 This rural congregation was the base of operation for John and Alfred Powell as they preached up and down the Willamette Valley. Who were these pioneer men? They had farmed and preached in Athens, Illinois, 13 miles north of Springfield. The decision to come to Oregon was because of the milder climate and fertile land offered free by the U.S. Government under the Donation Land Claim law. These DLCs were 320 acres for each adult, 640 for a married couple. In April of 1851 the greater Powell family had sold their farms and assembled about 20 wagons with four yoke of oxen for each wagon. 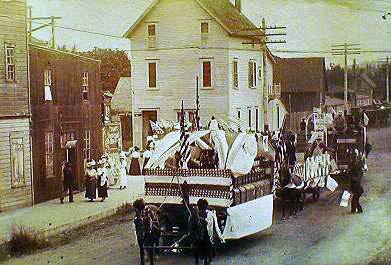 One traveler recalls that each of the family heads also had a family carriage drawn by two horses. The family heads were John Alkire Powell, Alfred Powell, Noah Powell, and George Alkire and the travelers were dubbed the "Powell Train." Besides rain, snow, floods and hail, there were wolves, buffalo stampedes and scurvy. Not every emigrant completed the trip. One was buried enroute. The Powell train encountered only friendly and helpful Indians. The families settled east of Albany except Noah, who settled to the north near the present Marion in Marion County. 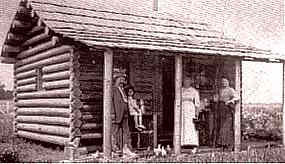 They built 16 foot square log cabins (similar to the one pictured at right) and had set up housekeeping by December of 1851. John and Noah had married Smith sisters. Sevilla (1812-) was married to John and Mary to Noah. In Sevilla's kitchen could be found a tea kettle, coffee pot, frying pan, stew kettle, two pans and a deep skillet with a lid to bake bread in. John Powell preached on the second and fourth Sunday of each month while Alfred preached the first and third. As the congregation at Central developed, John and Alfred often traveled as a team, Alfred leading songs and doing the exhorting while John did the preaching. It was common in those years for an exhorter to take over at the end of the sermon. It was a rare service when sinners did not come to confess Christ at the invitation time. He was six feet in height, and weighed 225 pounds . . . . His commanding appearance, his strong, clear voice, and his logic and magnetism easily enabled him to hold the undivided attention of his audience for an hour and often much longer . . . . He was of a serious turn of mind, and seldom indulged in a jest. In contrast to the fiery exhortations of his brother Alfred, his public discourses were quiet and dignified in style; his manner of speaking was deliberate. His sermons did not call for great demonstrations, but were designed to give men food for serious thought concerning the great issues of life." The attendance began declining. In 1881 they reported 31 members and Albert Powell and Ephraim W. Barnes as circuit-riding preachers. With the advent of the automobile, the congregation began attending the nearby Crabtree and Albany congregations. Later some settled at the Southside Church of Christ in Lebanon. Many of the pioneer families are buried in the Central Santiam Cemetery. It is reached by turning east from the I-5 freeway on Highway 20 and driving to the five mile post, then turning north for about a mile on Harber Road. It is plainly marked. A partial listing of the Central Santiam Cemetery is available with headstone photos. 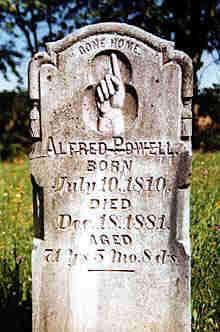 Due to the photographic efforts of Bill and Mary Burton of the Highway 20 congregation in Sweet Home we can display the tombstone of Alfred Powell. Take note of the view the pioneers had of life. Alfred has simply "Gone Home." If it had been written then, they would surely enjoyed singing "This World is Not My Home, I'm Just a Passing Through." 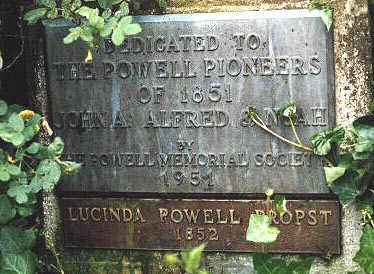 Pioneer Reminders: Powell Lane, Central Cemetery. The village was named for Scio, Ohio which, in turn, was named for Scio (Chios), an island off the coast of Turkey mentioned in one of Paul's journeys. This writer one time had a fine lunch on Chios. The oldest church in Scio, the Christian Church was established in 1852 with services held in the log cabin of John G. (1795-1872) and Orpha Richardson. They lived in the area soon called "Richardson's Gap," a half-mile wide gap between two ranges of hills. They built their cabin on a small promontory a few feet above the valley floor. This was located two miles east of Scio and one mile south. The Richardsons were of English, Scottish and Irish descent. They had arrived from Illinois in 1851, bringing their nine sons and one daughter. The sons scattered throughout Marion and Linn Counties. Leadership for establishing the Scio congregation came from son George Richardson. He wrote later to the Christian Herald that four of the six charter members had passed away, so the church must have started as a family gathering. John and Orpha Richardson are buried in the Providence Cemetery near Scio. After outgrowing the private home, the fast-growing group met at a school right in Scio, about 1,000 feet north of the present building. (It was a log cabin on Third Street, right behind the present Baptist building.) Then property was purchased from Henry L. Turner of Turner for $1 in 1863. By 1869 there were 162 members. "A small church building was erected on the present site of the Christian Church on Second and Alder streets sometime before the Civil War." That building was burned. The church reported just 32 members in 1881. The circuit-riding preacher was Ephraim W. Barnes who came twice each month. --- SCIO, Oregon, Feb. 18, 1885. -- Dear Bro. Stanley: I have accepted a call from the church at McMinnville, and will move there some time in March. I will devote the whole of my time to the one church. . . .
. . . we leave the good brethren and sisters at Scio with many kind remembrances during our nearly three years stay with them. . there have been many things to rejoice our hearts, and some sadness. We came to them as an entire stranger, and found kind, sympathetic hearts. Some strong in faith, some others wavering, but kind hearts. May God bless and confirm the strong, encourage and strengthen the weak. A new building was completed in 1890. The church continues to this day. Preacher Mike Owens reports that square nails were recently discovered in the original portion of the building. The church has kept a list of their pioneer-era preachers. Lewis C. Rich was ordained there in 1855 and presumably took the leadership for the next ten years; Daniel W. Elledge, pioneer of 1865, was there in 1866; George M. Whitney, pioneer of the 1850s was there in 1868; and John Moses Harris, pioneer of 1865, was there in 1869. Also sharing that date was John Alkire Powell, pioneer of 1851, based a few miles south at the Central Church; a Brother Manning, otherwise unidentifiable, in 1874; John Powell again in 1876; James Morgan in 1877; M.M. Warren in 1879; Ephraim W. Barnes, pioneer of 1852, in 1880; D.M. Doty in 1884; and Elijah H. Richardson was ordained there in 1885. Following Richardson was W. W. Hallan in 1891, A. Cane in 1895, George E. Southerland (former Baptist minister) was ordained in 1896 (Christian Standard says 1890) and L. C. Haulman held a ministry there in 1896. Pioneer Reminders: Richardson Gap Road, Richardson's Gap Grange Hall. Washington Crabtree was a leading member of the Scio church, but sometime after 1863, he established a congregation on his own Donation Land Claim at Mt. Pleasant, seven miles north and east of Scio. The property deed was transferred to the church in 1877. This is the oldest standing building west of the Rockies that has been used as a Restoration church building. The church building was constructed in 1854. Mr. Crabtree may have been active in both places during the same years. Existing records of membership only go back to 1877, so the building was used as a meeting place earlier, but the church was not formally organized until 1877. The one remaining original bench. Built before Abe Lincoln was President. Some of the timber in the building was local and some -- probably the milled floor -- was brought from Oregon City by ox cart. The original building was of box construction with no studs or framework, just boards nailed to other boards with square nails. In recent years, a six by six inch frame was put inside to straighten the sagging building. Its shake roof lasted around 100 years and has been replaced with a metal roof. The foundation consisted of large, flattened stones on the perimeter and oak stumps for the inner footing. The building is located on Ridge Drive at the intersection of Kingston-Jordan Road and Huntley Road, about five miles south of Stayton. The property was placed on the National Register of Historic Places in 1974 and the Linn County Register of Historical Properties in 1985. The year Washington Crabtree died, the building was transferred to the Cumberland Presbyterian Church and, more recently, to the community church. Washington and Susannah Crabtree were from Washington County, Tennessee, coming overland in 1851. Two of their daughters married two of John Richardson's sons during the years they all attended the Scio Church. They continued to live in the district. The senior Crabtrees are buried at the Wisner Cemetery, as are six of their seven children. The Wisner Cemetery listing is on-line. An incomplete list of members prior to 1882 includes: Eileen Caldwell, A. C. Christman, Lizzie Christman, Minerva Christman, George Churchhill, Chauncy Cole, Julia A. Cole, Nancy E. Cole, James Isaiah Crabtree (married Martha Ann Shelton), Pliney Perdew Crabtree, Susannna Crabtree, Washington Crabtree, B. F. Darby, Harriett Darby, Nora Darby, L. Dart, Annie Ground, Prince Ground, Susan Ground, Arthur Kelley, Meinnia Kelley, Ellen King, Americas McCurly, Nancy McCurly, Edward Axel Pedigo, David Philips, Martha Phillips, J. A. Raines, Laury Raines, R. F. Raines, Andrew Jackson Richardson, Mary L. Richardson, John Shore, Julia A. Shore, Samuel Shore, Benjamin Siler, Mrs. N. J. Siler, Margaret Smeltzer, Younger Smeltzer, Ida Straswell, Jacob Straswell, N. Titus, Reuben A. Titus, Sylvania Titus, Elijah Weddle, Mary Weddle, Newton Weddle, Carrie Wilkins, and James Wilkins. These records were taken from the original church record book. -- Bro. E. W. Barnes has returned after a short "digression" of some three years. He expresses himself as fully satisfied to leave the errors of Adventism behind and again preach the simple gospel. He was received into full fellowship by the church at Salem, June 18, and fully authorized to preach. . . . We are truly glad to welcome Bro. Barnes back. He is a brother who we always esteemed highly, and felt a deep sorrow at his mistake in accepting the doctrines of Adventism. Churches desiring protracted meetings will find in Bro. Barnes an able workman. Member Elijah Weddle reported in 1890 that he was preaching one time each month for the group and that it had about 40 members. The church was at peace. The location of this town is very uncertain. The church reported 14 members in 1871. One of the problems is locating the town is that several places right in Linn County had Soda Springs or a similar name. Historian Doug Dornhecker of Lebanon wrote in his thesis that "It was located near Sweet Home, close to the South Santiam River, northeast of Foster." Oregon Geographic Names, 6th Edition, say "Soda Springs is shown on old maps in the east part of T13S, R 1E, northeast of the present community of Foster." Soda Springs does not show on the 1895 map of Linn County so the community did not last long. It does show on the 1878 map of the Willamette Valley included in Christians on the Oregon Trail, 2nd edition. (The maps do not have page numbers and are in the center of the book.) That location is about equal to the present-day Bellinger Scale Road, northeast of Waterloo. There is a cemetery just off of that road, to the east and cemeteries sometimes indicate that a number of people once lived in the area. We will probably have to leave this mystery unsolved for the present, but maybe some person in the vicinity can supply the missing pieces. In 1882 just 16 charter members banded together to establish a church in this community named after Albany, New York. They met first in the home of Isaac Hayes and later in the YMCA Hall and Court House. Among the charter members were Joe Earl, Jermina Powell Earl, E. J. Burks and Mr. and Mrs. Mike Cowan. George M. Whitney was the first minister. He had preached at Scio at an earlier date. Some of these folks has been at the Central Church, about five miles to the east. The Albany Church actually considers the Central Church its place of beginning. There was a time when the children of Republicans and the children of Democrats attended different schools in Albany. This segregation was eventually abandoned and in 1887 the church purchased the Dixie School house from the Democrats for $25 and moved it to 5th and Jackson, remodeling it to be suitable for a church. It was dedicated by H. M. Waller, originally of Eola, near Salem. Waller was a Democrat, as well! Bro. Waller has been a faithful worker and has accomplished much for us. . . . When Bro. Waller came we had no house and the members had scattered and become cold and indifferent but today they are alive and all work and in perfect harmony and peace prevails. The praise to God is that so much has been accomplished in the year just closed. Yes and by God's help we are going to keep alive. Spelling and punctuation of the original has been retained. James Foster Stewart arrived in 1889. Mr. Foster was a graduate of Eureka College in Eureka, Illinois. In an era when preaching contracts were for one year, it should be noted that he remained three years. He also held ministries in Portland as well as a number of cities in California. Mr. Stewart was conducting a night-to-night meeting at the Albany Church that was closed down after 15 days because of a diphtheria epidemic in the community. Our house is too small to hold all that came, and it was estimated that fully 100 wee turned away from a single service for want of room. God has greatly blessed our labors in this city; eighteen months ago when we came here the church numbered 35, and had monthly preaching with a debt of $300 on their house. The debt is now paid; 78 have been added to their number, and we give them all our time. The minister that led the church from the small building to the completion of a sizeable structure was J. B. Holmes. Property was purchased and money raised for construction in 1898. 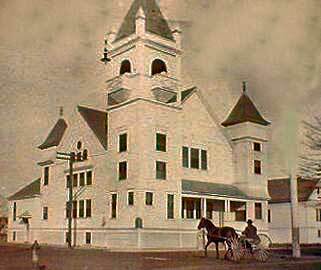 The church built at 4th and Broadalbin and the building was finished and dedicated by C. R. Scoville in 1900. The building is pictured below. A photo of Mr. Holmes is with the Klamath Falls Church. Note the transportation system in the foreground. Church records show that 1,025 people attended the building dedication. Two-hundred and twenty came forward during the meeting connected with the dedication, forty on the last day of the meeting. After Scoville's revival meeting, the brethren were numbered at well over 200. Mr. Scoville soon became nationally known as an evangelist and singer. There is a profile of Charles Reign Scoville. The Albany church has since built a modern facility. It is located in the original part of town and is affiliated with the Disciples. Mill City Yahoo Map At the red star. The mill that inspired the town's name was moved to the area in 1887. Almost immediately we see a number of people associated with the Stone/Campbell Movement moving into the emerging community. Part of the town is in Marion County and part is in Linn County. Because the church was in Linn, we are listing it here. Late in 1889 A. B. Wade reported to the Christian Standard that he had just established a congregation in Mill City. He wrote, "We closed, leaving as a result of our work, 31 members." The work of Mr. Wade was continued by circuit-riding Samuel Y. Bailey from Garnett, Kansas. He divided his time with the Stayton Church in Marion County. In the following summer, B. F. Bonnell conducted a gospel meeting at Mill City and Mrs. Bonnell led the singing. As a result of the meeting, three were immersed into Christ and a church building was started. Other records show that Ephriam Badger moved to Mill City in 1888. It was from here he intensified his study of the Scriptures by taking a correspondence course from Dr. Ashley Johnson. Mr. Badger went on to preach throughout Oregon, Washington and California. We have a photo and profile of Ephraim Badger. The membership list may have looked like this: Ephraim and Tavie Badger with Daisy and Rose. Tavie's mother Lavina Lovelady and her mother Mary Ann Bounds. Then there was Lavina's brother Henry McBride. Thomas R. Badger and Mary Ellen were there with their children, also. 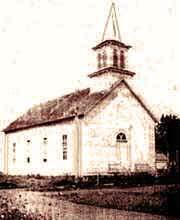 The church was incorporated with the State of Oregon on August 1, 1890 by Thomas R. Badger, Philip A. Carroll and Harvey Ward. Our thanks to Bev Shubert from providing this information from the private papers of Daisy Badger Lewman. Daisy was an eye-witness. This church did not last many years. It died and was replaced by a group that seems to have no memory of the earlier group. 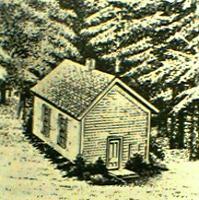 We could not locate a record of this pioneer Church of Christ in the community. The Church of Christ that is there now, renamed The Mill City First Christian Church, began in 1926 with a very successful gospel meeting by Teddy Leavitt. Dozens were immersed into Christ in the Santiam River. About 1890, another church formed near what is now the Davis Airport at Gates. The area was known as King's Prairie. This group became today's Gates Community Church of Christ and does not appear to be connected with the older Mill City Church of Christ. The membership list is entirely different families. The town of Kingston in Linn County had faded away by 1924. The church was started about 1898 by a group that had attended the Stayton church but lived across the river. Kingston had the railroad and it was supposed there was to be a growing community. Swander says, "But the church did not long continue." Victor Emanuel Hoven noted the church was still in existence in 1917. It reported 50 members at that time. Evidence that a community once existed is present in the name of several local roads and the cemetery on the Kingston-Jordan Drive south of Hetch Drive. A congregation was established (about 1906) at the intersection of Berlin and Upper Berlin roads east of Lebanon. 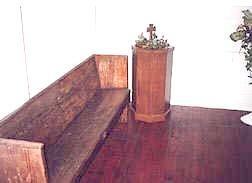 The congregation existed only a short time and became a community church. The former McDowell Creek Church was about two miles from the site. The Christian Church (Disciples), established in 1908, is the oldest congregation. It is located at 2nd and Grant, as is the a capella congregation. A small a capella church also meets at the corner of 5th and Ash. The independent South Side Church of Christ is at 196 Airport Road. Several descendents of the Powell brothers attend this congregation. The Lebanon name had its roots in Lebanon, Tennessee and a prominent road in the area still bears the name Tennessee Lane. Early records indicate this congregation was established in 1909.